Ducks are traditionally baked in the oven to the holiday table with apples, buckwheat and even with oranges, but not less delicious and tasty soups from duck meat. It is rich In vitamin b and other beneficial trace elements. It is believed that the meat of a duck increases sexual potency. This bird has more fat compared to chicken and Turkey, so the diet is unlikely to fit. But if you duck meat is not contraindicated, it is necessary to introduce it into your diet. Duck fat contains various enzymes that help cleanse the body of harmful carcinogens. 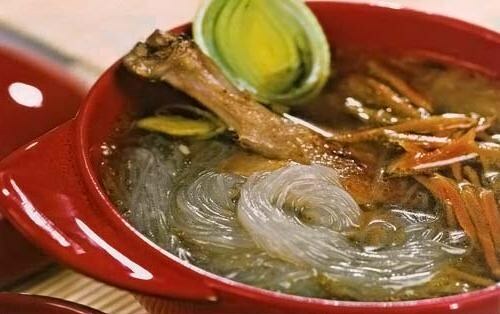 For soup of duck with homemade noodles suitable and broiler, and the rustic bird. Have broiler duck meat softer, the taste closer to chicken and a soup from the broiler quickly. Village poultry are larger, more oily, yellowish skin. Broths and soups made with domestic ducks are more fragrant and rich. If the soup you bought at the store duck (broiler), before cooking, defrost it, then rinse well, gut and cut into pieces a La carte. Put the duck pieces in a saucepan, cover with cold water, put on medium heat. When the broth boils, remove the foam, add salt and cover the pan. The broth needs to simmer for about forty minutes. For homemade noodles, pour the flour slide on a clean table or a special cutting Board. Make a well in the flour deepening and add the egg. Then gradually sprinkle cold water and knead tight dough. Thinly roll out the dough with a rolling pin, preporuciti the top with flour and cut into strips with a width of 5 centimeters. Test strips are put in several rows and finely slice lengthways. Should get noodles 5 centimeters long and 0.5 centimeter wide. Then lay strips in a single layer on a sieve and deselect the excess flour. The noodles are ready for cooking. Carrots and potatoes a good wash, peel, cut into cubes and add the duck broth. Onion peel and cut into thin half-rings. When the duck boil for 10 minutes with potatoes and carrots, put in a saucepan the onions and add the spices. For duck soup best suited Bay leaf and different types of pepper: black, white. Add to the soup a handful of homemade noodles and stir well so that the noodles do not stick to the bottom of the pan. Cook for another 15-20 minutes. Wash, dry and finely chop the parsley and green onions. When the duck soup is ready, sprinkle it on top of the greens. To duck in the soup was soft, the cooking broth should be on low heat. If you bought a duck with giblets, add them to the broth when cooking. And the soup will acquire additional nuances of flavor and aroma.